Gundam Seed has gotten me into another round of robot obsession lately. The show does the “sentai” thing again with 5 initial Gundams to sell more toys, but the new designer they employed, Junichi Akutsu, cranked out some of the best designs. Strike was an instant favorite, and both Aegis and Blitz were impressive as well. They are more streamlined, instead of the more toy-liked appearences by the original designer Kunio Okawara. Anyway Blitz is the covert operative in the team. It has this special armor coating that allows it to go invisible to radar detection, which the pilot Nicol Amalf used to his advantage to sneak in a colony and disable its defense. 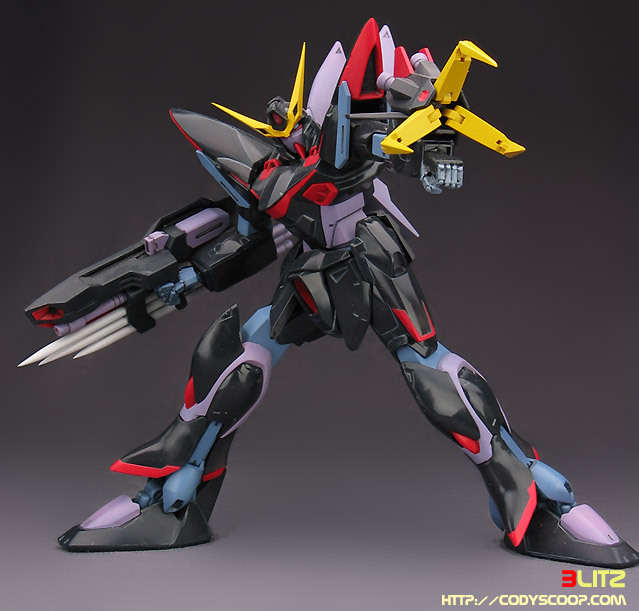 The ninja-like Gundam isn’t particularly strong in its offensive abilities, the special armament of its shield/lance/beam rifle combo becomes his trademark weapon, as well as the grab claw on his left arm. Unfortunately, Nicol’s useless bravado in trying to save Athrun costed him his life, and Blitz was cut in half, half way through the show. However, its parts (notably the right arm) was savage later by Orb to build the Astray Gold Frame. Pretty nice kit, with parts very conveniently divided for painting. The way the ankles are designed gives incredible leg poseability. BuildingThe main mod for this kit is converting the shoulder joints to ball-and-socket type, so that they can have wider range of movements. Various ends are sharpened, including the “mouth.” I rarely do gloss coats for mechs but black + gloss is a very nice combination, plus Blitz’s armor has this special coating for its covert operation, so I thought I’d give it a go. I love the outcome ^_^ The groin/thigh axis is lowered, and the thigh is shapened in a way that allows the legs to go wider V. Finally, although the open left palm is very nice, I think some poses look better with a fist, so I gave it one from the B-Club Strike Gundam HDM set.